Over 100 Karen youth leaders from Karen and Mon states, as well as Bago, Tanintharyi and Yangon regions gathered in the past week at a networking event to discuss how ethnic youth can get involved in the peace process and work together more closely. 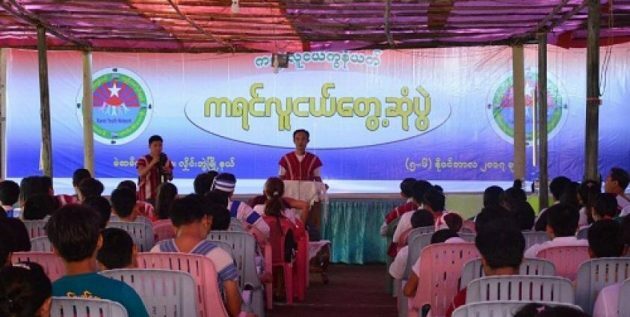 In the hopes of rallying young leaders and future negotiators, the Karen Youth Organization (KYO) and the Karen Youth Network held a meeting in Me Sa Meik Village in Hlaingbwe township, from November 5 to 6. KYO chair Saw Ler Ner said the meeting help build unity and establish a network to share experience. The two-day meeting covered how the youth can get involved in the peace process and how they can fulfill their Karen national duty. The participants also shared opinions about the current peace process and political situation. P’doh Mahn Nyein Maung from the Karen National Union (KNU)’s Central Executive Committee, said in the past, Karen youths faced difficulty in networking. But now that the government has removed the KNU from the Unlawful Association Act after the signing of the nationwide ceasefire agreement they should be able to network transparently. “This is the first time the Karen [youth] are able to hold a political dialogue. I feel satisfied,” he said. “The Karen revolution is in the hands of the Karen youths,” he said.